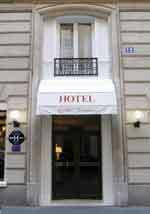 The Sophie Germain hotel is ideally located on the left bank of Paris. Near Place Denfert- Rochereau, just a few minutes away from Montparnasse train station and the Latin Quarter. Very easy access to events and exhibitions organised at Porte de Versailles and Villepinte. The Sophie Germain hotel will be your starting point to discover the beauties of Paris. he Sophie Germain hotel is located in the 14th district of Paris, near the Denfert-Rochereau Place and superb market street called Daguerre. Denfert-Rochereau Place is a central point in Paris and very close to Montparnasse train station. It gives access to tradeshows of Villepinte by RER B (35min) and the Porte de Versailles (15 min). To end with, you are just quite near the center of Paris.